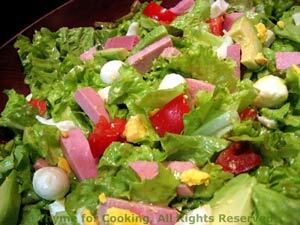 Mozzarella and Ham Salad, easy gourmet summer salad recipe. A cold salad can be just the thing for a hot summer evening. Other than the eggs, nothing is cooked; just assemble and serve. The small mozzarella balls are great for tossing with a salad; if you can't find them, just roughly chop half of a larger, whole mozzarella. Serve some crusty, country bread on the side, if you like. Cut cheese and tomatoes in half. Remove pit from avocado and slice. When eggs are done, cool, peel and cut into pieces. Add 2 - 3 tbs vinaigrette to lettuce and toss well with tongs to combine. Taste, adjust. Add ham, tomatoes, eggs, cheese and avocado and toss gently. Serve, extra dressing on the side. Whisk vinegar and lemon juice.